The Anker Clock was built in 1911 to 1914. 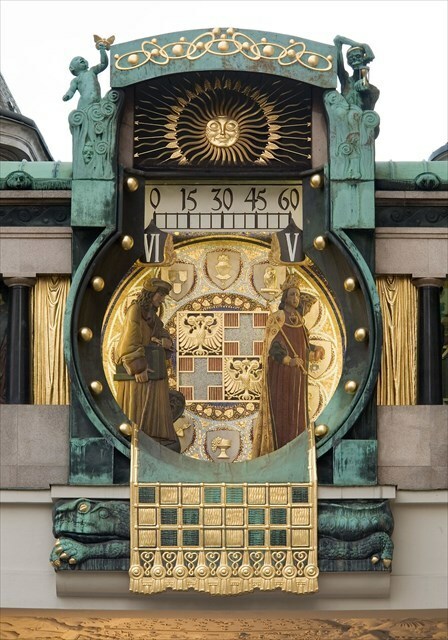 It was created by the painter and sculptor Franz von Matsch and is a typical Art Nouveau design. Franz von Matsch made it for the prospering Anker insurance company and bridges the two administrative buildings of this corporation. It is 10 metres wide and 7.5 metres high and the clock itself has a diameter of 4 meters. The 12 celebrity figures from Vienna's history were made of copper. Each hour one or a couple of the figures is visible and on the hour a tune matching with the figures is played. At noon you can see all the figures and hear their respective tunes. Josepth Haydn is the last figure. Originally his tune was the Imperial Anthem that he has composed and which Germany now has as their National Anthem. After the revolution in 1918 the Republic of Austria decided to use a different composistions of Joseph Haydn. The Anker Clock is located at the Hoher Markt Square and is one of the oldest squares in Vienna. It was part of the Roman army Camp Vindobona back in the days. Today there is nothing left of the Roman traces. To claim this cache as found take a picture of yourself and your GPS with the Anker Clock in the backgroun or only your GPS with the Anker Clock in the background and upload your pictures with your found it log.